Here are two of our popular spiral notebooks, made with coated wood pulp paper. They can be written on with either a pen or a pencil. Each of these can be put to excellent use, but there are a few limitations. We explain the merits and limitations of each below. The best pens to use when writing on waterproof paper are standard ballpoint pens with a medium width point. Standard ballpoint pens work fine, but some people prefer to use a pen that writes with waterproof ink. Waterproof ink refills are recommended because their ink will apply to wet paper and not be washed off by rain, dew, fog, sweat, spills, or an accidental dunking. Some waterproof inks have been known to survive trips through a washing machine, Grand Canyon whitewater, and, years of being lost in a forest. We sell multiple brands of waterproof and weatherproof sheet paper that you can use for writing paper or for creating forms, maps and other documents with laser printers, inkjet printers or plain paper copiers. 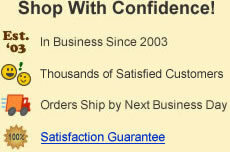 The pens that we sell are shipped with a medium-width ballpoint refill that contains black waterproof ink. They mark on wet paper, write when upside down, and perform well at all temperatures between -30F and 250F. We also carry refills with waterproof ink in other colors and other line widths. Medium point pens are recommended because fine point pens can dig into wet paper unless you have a very light touch. Broad point pens can lay down more ink than can quickly be absorbed by the paper, which can result in smearing. Standard ballpoint pens sometimes refuse to write under wet or cold conditions. They can contain water-soluble ink or ink that becomes too thick or thin to flow properly under hot or cold conditions. Gel pens perform poorly because the ink is water soluble and will smear - even on dry paper. We always recommend testing your pen and paper combination in the environment of use to be sure that they are compatible. A weatherproof field desk with clipboard is perfect for taking notes on sheet paper or forms in the field. Many people enjoy writing with a pencil because of its simplicity and the ability to erase. For best results on the papers that we sell a hard wide lead performs best. Soft leads tend to smear and narrow leads tend to dig into wet paper. The mechanical pencils that we sell have a sturdy casing that is built to last and write for years through rough conditions. They write well on most types of paper, lumber, sample bag tags and many other mediums. The mechanical pencils are shipped with six HB (No.2) leads in a 1.1 millimeter width. Wide leads break less frequently and write smoothly over wet paper. They also ship with two extra erasers. Replacement leads and erasers are available here. Note: Pencils write well on all of the notebooks and field books that we sell. A standard ballpoint pen is the recommended writing implement for iGage Weatherproof and PuffinPaper. These papers do not accept pencil and require a pen. Most gel pens contain water-soluble inks and are not recommended for writing that might come in contact with moisture of any kind. 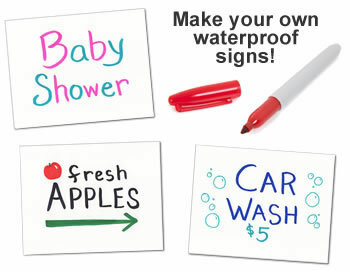 Your only limit is your imagination when you use Sharpie Permanent Markers to make waterproof signs. The Sharpie Permanent Marker is one of our favorite writing implements. You can use it to make great waterproof signs. Sharpies come in a wide variety of colors, point widths and point shapes. That variety gives you many options when making waterproof signs. You don't need to stop at "writing" because you can draw, doodle and express yourself in many ways. Kids love to draw with Sharpies. We think that PuffinPaper in the 10 mil thickness is great for making waterproof signs or just drawing with Sharpies for fun. One word of caution with the Sharpie. Just as when using them on any type of paper, you need to be careful about the ink bleeding through the paper - especially when using wide Sharpie markers or even fine point Sharpie pens that are new. Please test your Sharpie on the paper before you begin work. You want to make sure that it will not bleed through the paper. Use of a backing material beneath the paper is always a good idea when using Sharpies. Many people have asked us about using crayons and China markers on waterproof paper. Sometimes they simply want to use these writing implements. Other times they want to write with them and then wipe them off with solvent on a paper towel. We must say that crayons, China markers, and other wax-based markers simply do not perform well. They produce unpredictable results on fiber papers. And, they are also subject to being scraped off or smearing on synthetic waterproof papers. Dry-erase markers might mark well on waterproof papers but you should not have any expectation of erasing the marks. Most waterproof papers do their job by absorbing ink and holding it tenaciously. When that happens a dry-erase eraser will not remove the ink. We know people who use a dive slate for this type of waterproof writing.